So here’s the deal…not one of us who opens a small business does it to do bookkeeping unless of course, you’re actually opening a bookkeeping business. Most of us don’t want to think about it and well… even go to great lengths to avoid it. But you can’t pretend to be running a real business without being involved with the financial part of your business. Two reasons why you’ve got to do your books is 1) the IRS requires it, and 2) it will boost your chances of success. Check out the chart below. 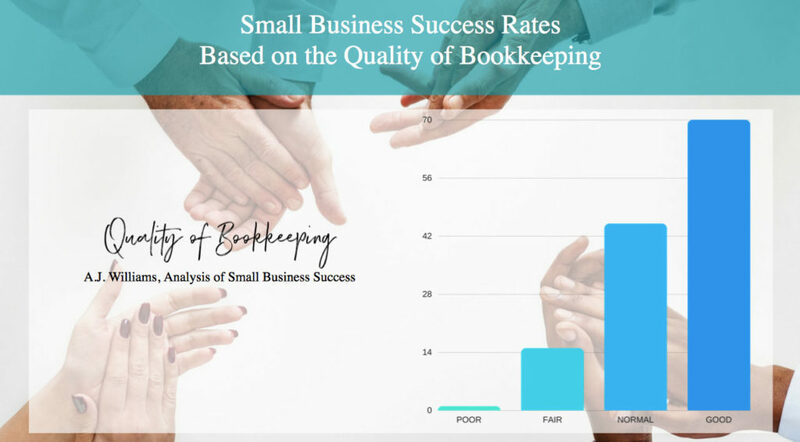 See how bookkeeping impacts the success of a business? And it’s so true, I see it in my practice constantly. But the good news is, I also see people making the effort to learn their books and get it right, and I’ve seen their businesses take off! When starting a small business, most of us use our own funds from our personal accounts, but as soon as you know you have a viable business, open a business account and get either a credit/debit combination card or a credit card. From that time on, use your business cards and accounts for business and your personal cards for personal purchases. You want to do that because it’s mental, baby! You’ll treat your business seriously. And so will the IRS. If you don’t keep separate accounts, the IRS may classify your business as a hobby and disallow expenses. And then there’s tax time – keeping accounts separate make doing your taxes easier. You’ll need to enter your income and expenses somewhere. Way back in the olden days, this was done with pencil and ledgers. I actually know an old guy who uses a spiral notebook and pen to track his little restaurant. Every day he carefully records what he purchased for the business, what he sold, and what he paid out in labor. It worked for him because he carefully tracked it. I’d never want to change him, but the rest of us? We need accounting software. Do your research carefully as to which software you select. If you aren’t familiar with what your company needs to best track your business, find an expert to help guide you set it up and train you. It’s worth the money. Make this part of your daily rolling-out-of-bed routine. Log into your bank and credit card accounts, and review all purchases and credits. You want to check for fraud and to see where your money is going. You’ll be more careful in your spending if you face it daily. This is critical. The successful businesses that I work with all have bookkeeping routines. You need to make a firm date each week to do your books, including recording deposits and posting expenses, sorting receipts and filing papers. Make notes on your calendar filing and tax deadlines. Do the same for license and insurance renewals. Here’s a sample of a bookkeeping routine. As a small business owner, you’ll likely deal with government agencies at the federal, state, and local level. You are expected to set up reporting and tax accounts. • Set money aside every month for taxes so it’s not such a big hit to your checking account. • Get that payment in on time. Late penalties can be from 2% (IRS) to 9% (WA State DOR), and from there they tack on more fees and interest. • Don’t trust that your bookkeeper will handle all this for you. It’s your responsibility as an owner to know what taxes you have to pay, when they are due and oversee that it gets done. • Put filing and payment dates on your calendar so you know when they are coming up.